Lutron Vive PowPak® Dimming module has voltage rating of 120/277-Volt AC at 50/60-Hz. This module provides switching up to 8-Amp load and is configurable with high/low end trim. It features Lutron patented Clear Connect RF technology works through walls and floors. It receives wireless inputs from up to 10 Pico remote controls, 10 Radio Powr Savr occupancy/vacancy sensors and one Radio Powr Savr daylight sensor. Module operates at a frequency band of 431 - 437-Mega-Hz. 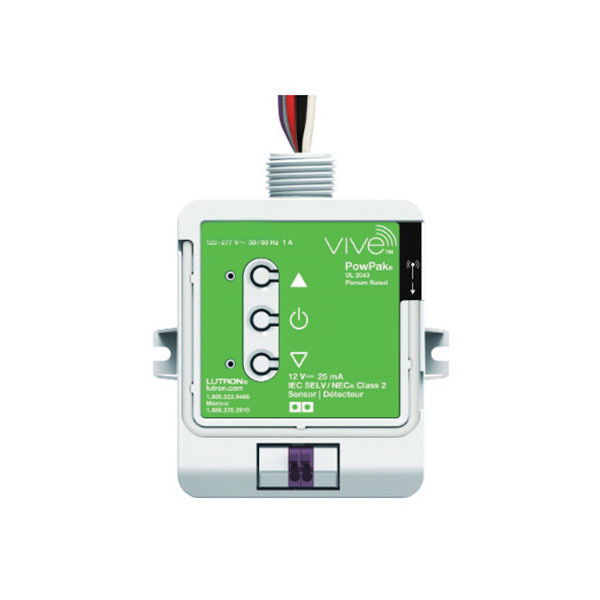 It allows easy installation to a US-style junction box through a standard-size knockout. It has maximum load capacity of 8-Amps. It measures 2.82-Inch x 1.25-Inch x 3.42-Inch. Dimming module operates at temperature range of 0 to 40 deg C. Dimming module is UL/cUL listed, NOM certified, FCC approved and meets NEC standards.